Large diameter parachute sea anchors are deployed off the bow, in deference to the way in which naval architects design hulls. Most naval architects design hulls to part the waves with pointed, low-buoyancy bows. Very few sailboats can part the waves with their sterns. In fact, with the exception of Polynesian Proas, no sailboat can sail backwards efficiently. The basic shape does not allow it. The design of the hull encourages forward motion relative to waves. It discourages backward motion relative to waves. What happens when a yacht is anchored to a large parachute off the stern and ten tons of water - moving at 30 knots - slam into the buoyant and flat surfaces that make up the transom and cockpit? Quite likely the yacht will be blasted forward like a golf ball off the tee. At this critical moment, a small drogue might get pulled through the sea for a few seconds. The large parachute, on the other hand, is not going to budge. Something will have to give, usually the nylon rode, which may stretch to breaking point or beyond the limits of its elastic recoverability. If the rode doesn't snap - and if the breaking wave doesn't smash through the companionway and flood the interior with tons of water - there is a possibility that the boat will be slingshotted backward into the next wave. In short, she may engage in some dangerous "bungee jumping." Theme park bungee jumps are designed for safety. One usually gets released from a height, stretches the bungee, and springs back up. Bungee jumping to a large sea anchor in a storm can be dangerous for a yacht however. Why? Because the vessel may run into another breaking wave on the rebound. One can imagine the scenario. A huge wave lifts up the stern and breaks squarely on the transom. The boat gets sledge-hammered into a free fall. The nylon rode stretches to the limit, arrests the free fall and begins to recover. The boat gets slingshotted backwards and slams into another breaking wave on the rebound. With her stern pointed to the seas the yacht wants to race ahead. Anytime the line goes slack (per orbital convergence, for example) she will try to take off on a sprint. If a wave breaks while she is gathering speed, she will be blasted forward, and the inertial loading on the cleats, the rode and the sea anchor (for the most part a product of the mass of the boat and its acceleration) may very well exceed the limits of those of components. If they don't, the yacht will start "bungee jumping," for better or for worse. Imagine a 1000 lb. iron weight hanging from a crane. 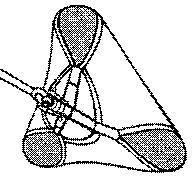 The load swings from side to side: this is analogous to the boat swinging on a big parachute off the bow. The entire dynamic changes when a large parachute anchor is used off the stern. Here the load is no longer merely swinging: It is being dropped as well. Now the drum is released, the load dropped ten feet, and the brakes applied again: this is analogous to using the same parachute off the stern. Question: How much force does the crane have to absorb when a load of 1000 lbs. is dropped ten feet? Given a normal stopping distance, about 10,000 lbs. The force is about ten times greater when the load drops than when it is held firm and merely swinging. Large para-anchors are designed to stop, orient and align small craft bow-on. If one desires to stabilize the attitude of a yacht while running, one has to use the partial braking mechanism of a drogue instead. Drogues fall into two basic categories: low-pull and medium-pull. Low-pull drogues are designed to be constantly towed off the stern as speed-limiting devices. Medium-pull drogues are also designed to be used off the stern, but they cannot be constantly towed: they bring the boat to a near stand-still and place it "on standby," being pulled through the sea only when the yacht gets struck by a breaking wave. A parachute sea anchor does not get dragged through the sea. A medium-pull drogue does, but only when the yacht is struck by a breaking wave. A low-pull drogue gets dragged - towed - through the sea all the time. The table below is intended to give a rough idea of how the three different types of drag device relate to one another in terms of diameter. Note, for example, that if the recommended Para-Tech sea anchor for a 40-ft., 20,000 lb. vessel has a diameter of 18 feet, then the vessel would require a medium pull drogue (cone or parachute) with a diameter of about 4.5 feet (25%), and a low-pull drogue (cone or parachute) with a diameter of about 26 inches (12%). 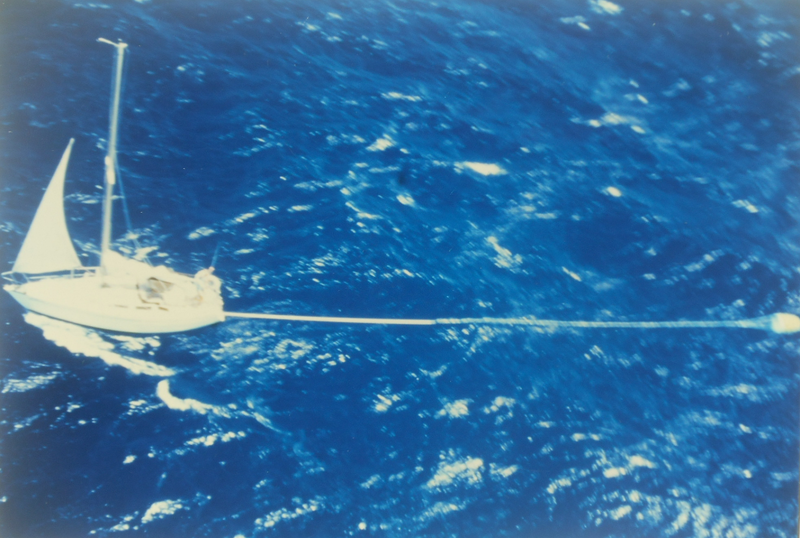 A low-pull speed-limiting drogue is towed off the stern to help keep the boat aligned in strong following seas. Its partial braking mechanism limits the speed of the boat and her angle of yaw. In this category fall the various items that may be towed behind a boat to reduce its speed down to a safe and sane 3-6 knots. Warps, bites of chain, automobile tires, bells, buckets and small drags of all shapes and sizes. And, of course, modern speed-limiting drogues designed specifically for that purpose, such as the Galerider. 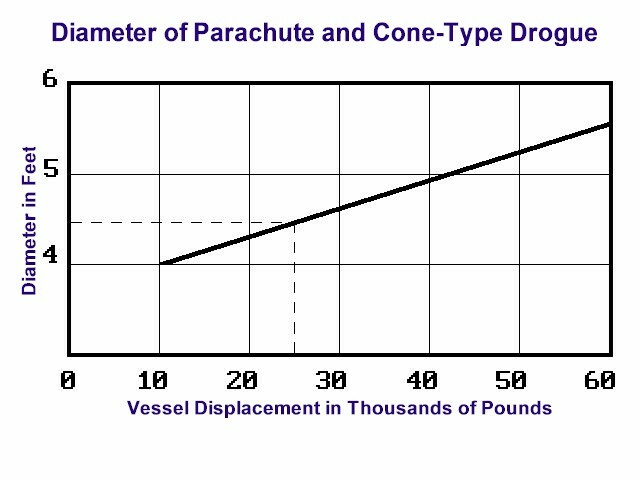 A speed-limiting drogue produces a fraction of the drag that a para-anchor does. Yes, in some respects it is a scaled down sea anchor, but that's where the similarity ends. Speed-limiting drogues must posses certain additional virtues that one would not ordinarily require of large parachutes. Why not? Because large parachutes cannot ordinarily be towed through the sea, whereas speed-limiting drogues have to be. Indeed, a speed-limiting drogue must possess certain "missionary" virtues. It must pursue a straight course, without wandering off to either side. It must track fairly straight, without "kiting," zig-zagging and porpoising. And it must be faithful in retaining its shape as well: It must not get turned inside out. This poses a problem, especially with textile fabrications. But there have been many clever solutions. One cannot merely scale down a parachute and use it as a speed-limiting drogue. A large - 18-ft. diameter - para-anchor is inherently stable because the vessel that it is intended for cannot tow it through the sea. A 2-ft. diameter parachute is another matter. Unless properly designed, small textile drogues and parachutes are very much prone to instability. They misbehave under tow. They yaw. They zig-zag. They flutter. They are subject to surface action. They dive and surface like a porpoise. And they have another unforgivable vice: they tend to get turned inside out in slack cycles, and pop violently open when the load is taken up again. An illustration: A speedboat is barreling along at 30 knots on a lake when the operator suddenly cuts the throttle. What happens? The boat gets overtaken and swamped by its own wake. This behavior results from the fact that the mass of water in the wake behind the drogue continues to move forward, after the tow line force has dropped to zero. This wake can collapse and even tumble the drogue. The problem relating to drogue stability can be approached from a number of different directions. One solution, for example, would be to design and construct solid drogues made of ABS plastic and/or aluminum. This was the initial approach taken by John Abernethy, inventor of the Australian Seabrake. Obviously solid drogues have no problem retaining their shapes, and they can be made to track like torpedoes as well. The disadvantage of a solid drogue, of course, lies in its weight and storage volume. Weight and storage volume are important considerations on small cruising boats. Drogues manufactured from modern textiles provide more strength and drag per pound of weight or storage volume than solid drag devices. They fold up into a small size and are easy to store. The trade off again has to do with stability and shape retention. Existing textile cones, for example, are notoriously unstable under tow. The principle cause of their instability has to do with the non-uniform wake - vortex trail - that forms at the separation edges of the cone. In short, the flow of water around and through the cone is not uniform at high speeds: it fluctuates, producing changes in the cone's "angle of attack," which disturb the wake, which produces oscillations, which produces unstable side to side, or up and down moments. How does one solve this problem? What does it take for a textile drogue to remain directionally and structurally stable under tow? The parachute industry has been wrestling with the same problem for decades and has come up with various stable drogue configurations. Indeed the legacy of Messrs. Smith, Ball, Russel and Irwin (those of the original 1919 McCook Field group that were responsible for most of the parachute development of the next thirty years) is now a highly articulated component of Defense and Aerospace industries. By way of a brief digression we should take note of the fact that Parachute Recovery Systems have reached a high degree of reliability, as documented by the 31 consecutive successful manned spacecraft landings. Huge Ringsail drogues were used as the main descent parachutes for the Mercury, Gemini, and Apollo spacecraft. Guide surface, Ribbon and Ballute drogues have been used successfully at speeds in excess of Mach 4.0 at altitudes up to the limits of the atmosphere, and at dynamic pressures to 15,000 psi. Disc-Gap-Band parachutes were used to land Viking and Pathfinder spacecraft on Mars, and to lower the Galileo probe into the gaseous atmosphere of Jupiter. Nowadays Conical Ribbon drogues, larger than football fields, are routinely used to recover the Space Shuttle's reusable SRBs (solid rocket boosters). The recovery sequence starts at 349.4 seconds after launch when the 11-ft. diameter pilot chute is deployed as the spent booster is jettisoned. This is followed by the deployment of a 54-ft. diameter drogue chute, going through three inflation stages in 12 seconds - accomplished by the use of explosive reefing line cutters. At T + 371 seconds "main parachute cluster" deployment occurs when the three 136-ft. diameter Conical Ribbon chutes go through three inflation stages, sequentially slowing the 185,000 lb. SRB down to a 45 miles per hour splashdown near a recovery ship, which brings it back for re-use on another mission. Millions of dollars have been spent by Defense and Aerospace to develop a wide variety of stable drogue systems, the technical aspects of all of which can be found in a thick book called Parachute Recovery Systems (T.W. Knacke, 1992, Para-Publishing). See also the Wikipedia article on parachutes. Increased Porosity: Very few of the exotic drogues used by Defense and Aerospace are of solid construction. Most are slotted, or fabricated from open weave materials. Some are gapped. Others have open areas. Others still have multiple vent holes. In short, all have relatively high geometric porosity (defined as the ratio of total open area to total canopy area). All are designed to allow considerable flow-through of air. The greater portion of the air flows through, instead of around. This reduces the non-uniform vortex trail at separations boundaries, in turn reducing the side-to-side oscillations that lead to instability. Drogues with high geometric porosity produce stable drag force to decelerate airplanes and sailboats alike. 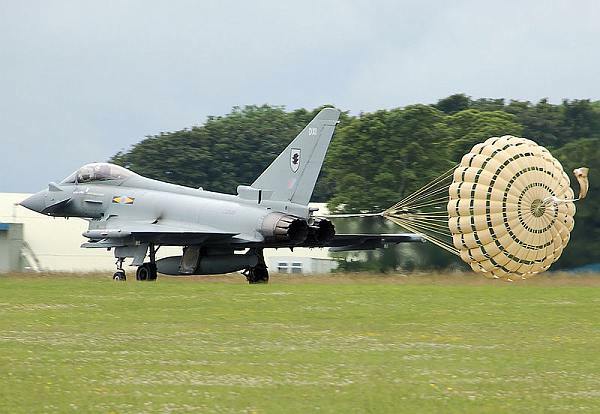 In many respects the Ringslot parachute used to decelerate a Typhoon fighter on a runway has a great deal in common with the popular Galerider drogue. Both achieve stability through a marked increase in geometric porosity. Galerider is the brainchild of Frank V. Snyder, Vice Commodore of the New York Yacht Club. Snyder put the original prototype together with the help of Skip Raymond, of the sail making firm of Hathaway, Reiser and Raymond. Galerider is made from heavy two-inch nylon webbing. It has a collapsible stainless steel wire hoop sewn into the skirt to keep the mouth open, and comes with a swivel termination to compensate for any rotation. It is stable under tow and its parabolic shape would be very difficult to turn inside out - scoring high points where it counts. See File D/M-3 about how the Galerider was first made and put to use. Guide Surface Principle: The second way of achieving drogue stability has to do with addition of a guide surface. Guide surface drogues are among the most stable in existence - the ones most often relied on for initial extractions. When a billion dollar bomber lands on a runway the little pilot chute that extracts the big ringslot parachute may be of guide surface fabrication. Many of the drogues used to recover missile components and test instrumentation are likewise of guide surface fabrication. Although the term guide surface smacks of technical jargon it involves a very simple idea. A "guide surface" is something that is sewn to the leading edge of a drogue to create a strong, uniform airflow separation around the edges (the same principle that lends credence to the use of spoilers on race cars). The addition of the guide surface smooths the airflow around the drogue, reducing unstable moments and increasing directional stability at lower speeds. And those angled leading edges create a massive normalizing force at higher speeds as well. This normalizing force combines with the stable drag force to create extraordinary righting moment when the drogue is displaced from its zero angle of attack position. The flow around an ordinary cone is disturbed by its changing angle of attack, producing unstable side to side or up and down moments. The diagrams above show the addition of a "guide surface" to an ordinary cone. Textile drogues manufactured by Para-Tech and Seabrake have a great deal in common with Defense and Aerospace guide surface fabrications. They use the same basic principle to create a more uniform water flow around leading edges. 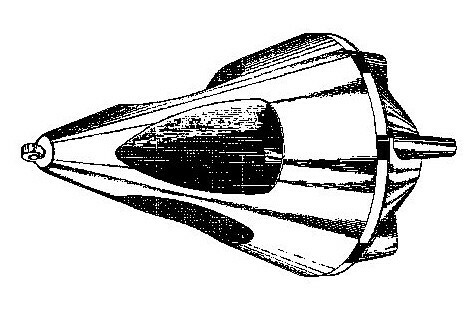 Note the textile "guide surface" positioned ahead of the conical drag element of the Seabrake GP-24. Inventor John Abernethy told Victor Shane that in addition to increasing stability, the interaction between the guide surface and the conical element produces a "staged" effect as well, somewhat similar to the spring-loaded mechanism that "kicks in" on his solid Seabrake MK I (spring-loaded gates open at seven knots to increase drag by about 70%). The GP-24 is heavily constructed, and does not spin, obviating the need for a swivel. It is stable under tow and would be difficult to turn inside out, also scoring high marks where it counts. See File D/M-10 for more on the story of how Seabrake was conceived in Australia's Bass Strait. Para-Tech's Delta Drogue is simple in both design and construction. It has a triangular - Delta - shape with angled leading edges that utilize the same "guide surface" principle to provide uniform flow. It makes partial use of the "ballute" principle as well - use of interior water pressure for shape retention. And its three radial slots have the effect of increasing drag as the speed increases. The Delta Drogue by Para-Tech Engineering is heavily constructed and comes with a swivel termination to allow for rotation. It is stable under tow, and its small mouth makes it all but impossible for it to get turned inside out, also scoring high points where it counts. There are other interesting drogue concepts on the market presently, and others will no doubt follow. 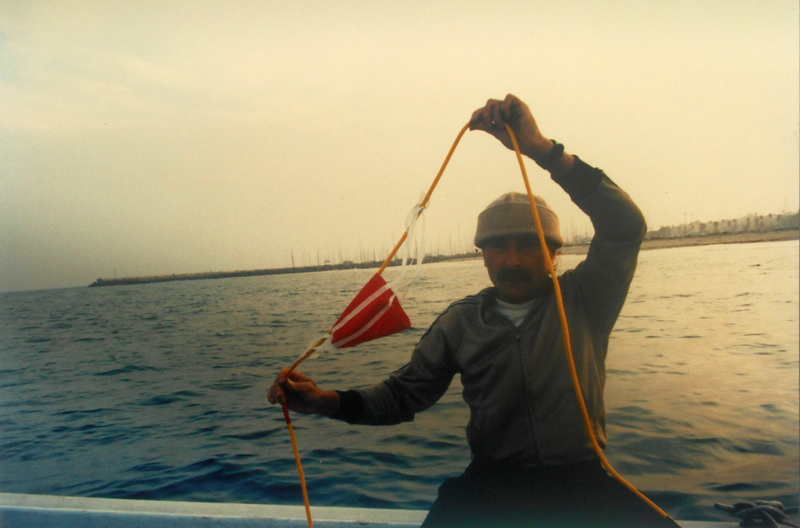 Shewmon came up with a Variable Pull drogue whose drag could be adjusted by means of a secondary line leading to the crown of the drogue - see Dan Shewmon's Sea Anchor and Drogue Handbook for details. The idea of a drogue whose pull can be varied on the fly is very desirable, even though the concept is difficult to perfect, especially with textile fabrications that are prone to inversion in heavier storms. Unfortunately it seems that Shewmon's drogues are no longer available on the market. Neil Attenborough of the UK invented a stainless steel "mine sweeper" drogue. The angled louvers of the Attenborough Sea Drogue make the device want to dive, increasing resistance in proportion to speed. Australians Gavin Le Sueur and Alby McCracken have similarly experimented with solid and textile fabrications, creating a para-drogue along the lines of a ringslot parachute. No doubt over time there will be other variations that appear. Reducing Storm Time: If a gale is moving steadily, one might use a large parachute to anchor the yacht and allow the system to pass overhead more quickly, cutting down on "storm time." While most gales do traverse oceans quickly and predictably, some other systems are downright fickle. Tropical depressions, for example, are notorious for moving about erratically, and it is not at all uncommon for a tropical storm to get stalled in place for a day or two. To be trapped in the dangerous quadrant of such a stalled system will obviously increase storm time. Since most tropical disturbances have relatively small diameters - typically seventy miles - a distance of even forty miles may mean the difference between thirty and fifty knots of sustained wind. In view of this, a skilled shore-based route forecaster may, after carefully assessing a particular situation, advise the owner of the yacht to crowd sail and try to distance the vessel from the developing system. While it makes sense to try to escape the clutches of a tropical depression that has very rudely parked itself overhead, we have already ascertained that running full bore in certain conditions may be hazardous. The vessel may broach, capsize, or fall off waves. A red-blooded sailor may say: "No problem! Leave it to me! I'll just strap myself in the cockpit and use the rudder to keep her from broaching!" Unfortunately small craft cannot always be kept in alignment by means of the rudder alone. The fact is that the rudders of big ships have been known to be lifted out of the water in storms, and we have already alluded to the difficulties involved in steering a boat that's being swept along on river rapids. Trying to keep the boat out of trouble by means of the rudder is not as easy as one would imagine. This is not to say that it cannot be done. Many legendary sailors - among them Vito Dumas and Bernard Moitessier - have managed to pull it off, and for them the near miss may have been "as good as a mile." The rest of us may not be as skilled - or as lucky. 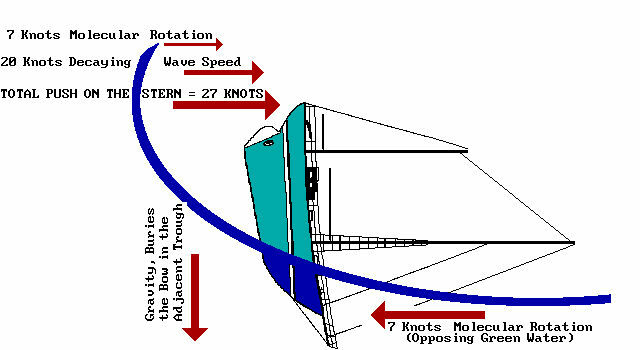 In the case of a yacht that is running downwind, the orbital rotation of the waves causes helm control to increase in a trough, but decrease on a crest. As the boat is picked up and accelerated by a wave crest, the flow of water past the rudder diminishes and the helm goes limp for a few seconds (as it would on a fast-flowing river). Those few seconds can amount to a large window of vulnerability. If the yacht is out of alignment when she gets struck, the wave-induced yawing moment may be greater than the restoring moment available from the rudder, and she may broach or capsize. This is where the directional restraint of a drogue - situated elsewhere on the wave train - is called for. The drogue helps keep the vessel aligned in the few seconds when the rudder is useless. The drogue may not be able to close the window of vulnerability entirely, but it can reduces its size. Speed-limiting drogues can therefore be of immense value when running before strong following seas. If running through or from a storm system is the last remaining option, a speed-limiting drogue - properly positioned on the wave trains - can increase the odds of successful escape. Just dumping the drogue into the sea and hoping for the best may not be enough, however. Positioning the drogue properly might be quite important because for one thing the drogue is itself subject to orbital rotation. If it becomes abundantly clear that the yacht and the drogue are working against one another on the wave trains, one should try repositioning the two. Fortunately this is not too difficult. One lets out or takes up the rode, a few feet at a time, to obtain a more uniform pull - reduce jerkiness, excessive slack and "bungee jumping." In this connection there are a number of additional drogue options and combinations that sailors should clearly understand and apply to further improve the odds of a safe run downwind. Do not gloss over the following points. Read and study them carefully. Your life may depend on it. Speed Adjustment: If the boat is obviously moving too fast (beginning to broach now and then), try paying out more rode. If we can ignore the effects of orbital rotation for a moment, the general rule is as follows: The longer the rode, the higher the pull. The shorter the rode, the lower the pull. If the boat is obviously moving too slow try taking in some rode. If winching in a hundred feet of rode is out of the question (and usually it is), try hoisting a storm jib. And don't forget that the engine provides one more option as well. Options are the stuff of survival! Always know your options. Visualize, number and prioritize them in your mind. At the same time don't be overzealous in applying every single one. "If it ain't broke don't try to fix it." No boat feels completely safe in heavy weather. If she seems to be doing all right and there are no obvious problems, leave well enough alone. Rogue waves and chafe notwithstanding, you stand a good chance of coming through in fair shape. Try to conserve your own physical and mental resources. You may need them later on. Repeatedly going on deck to fuss with this and that may sap your strength, and if the boat does get thrown by a rogue wave you may not have the strength to make it through a search and rescue operation. You should always leave enough strength to deal with that eventuality. The boat is replaceable. You are not. Minimum Steering: If you are running squarely downwind, if you are tired or shorthanded, if you want to try to get the drogue to "take over" and do most of the steering for you, then use a bridle off the corners of the transom (Fig. 22). Multihulls use a bridle off the extreme outboard ends of the amas. Adjust the bridle for the safest ride. Raise all swing keels and board/s. 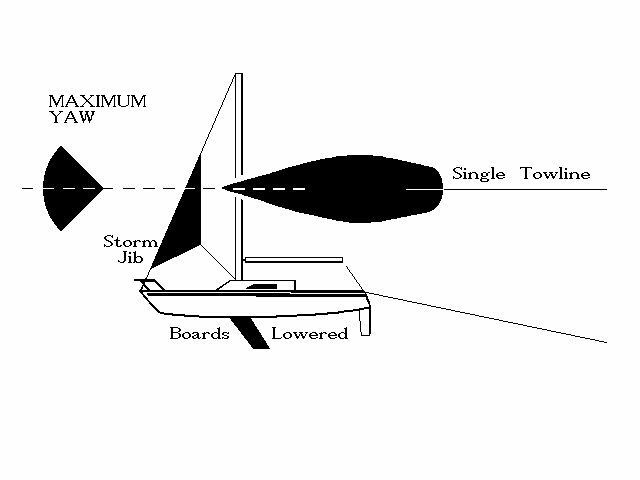 If necessary, use the storm jib as a weather vane - hoist it on the forestay and sheet it in tightly amidships, so that it looks like the flat rudder of an airplane. In this case the jib does not fill and pull. It acts as a vane, to weathercock and align the boat. You may be able to leave the helm unattended by using this formula. NOTE: This formula will not allow the boat to be freely steered. Moderate Steering: If you are not running squarely downwind, if you prefer to steer manually, if you prefer to quarter the seas the way that Dumas and Moitessier did, or if you must steer in order to dodge nasty waves, then do not use a bridle. Bring a single tow line to a stern cleat instead. Still too much interference from the drogue? Need even more helm override? Bring the tow line to a cleat or winch well forward of the rudder. Have you ever tried to tow another boat? If so you know that it can reduce your own maneuverability, that is, unless you bring the tow line to a cleat or winch well-forward of the rudder. Have you ever noted the location of the big sampson post on an ocean tug? It is not on the transom, is it? No, it would be impossible for the tug to maneuver with a ship in tow if the bollard were on the transom. Rather it is situated in the middle of the after deck, well forward of the rudder. Moral: The attachment point of the drogue has a great bearing on the maneuverability of the yacht. Aft of the rudder = less steering control. Forward of the rudder = more steering control. Maximum Manual Steering: Need still more helm control? Lower swing keels and board/s. CAUTION: Lowering board/s and keels, or lowering them all the way, may give the yacht something to trip over. By and large, and as an important rule of seamanship, boards and keels should be raised while running so that the yacht can "slip-slide," and not have something to trip over. Need even more steerability? Raise the storm jib, only this time let it fill and pull like a spinnaker - do not sheet it in amidships. You should then be able to steer the boat through an arc of 90°, usually enough to help you avoid navigational obstacles, and/or play dodgem with the nastier waves. A helicopter view of a Ranger 29 towing a Galerider in Force 6 conditions. Victor Shane and Earl Hinz were on board. The drogue had an immediate stabilizing effect on yaw, pitch and roll rates. If running is your only option, if there is plenty of searoom to run in, and if your boat is well-crewed, these are the combinations that you can tinker with in order to optimize your chances. Bear in mind, also, that the above options can be used in various combinations to improve the performance of a makeshift drogue as well. If the line chafes through and you loose the Galerider, don't panic. Use an anchor, some parceled up chain, a spinnaker pole, a bit of sail, a submerged dinghy - or the kitchen sink - as makeshift drogues. Then tinker with the ten options listed above to get your money's worth and maximize your chances. Speed-limiting drogues have a number of other uses, any one of which can justify the money spent in buying one. Some of those uses are listed below. Trade Wind Use: On a downwind leg in stiff trades, a speed-limiting drogue can turn an uncomfortable roller-coaster ride into a "Sunday afternoon sail." We all rely on the 'engine' of the trade winds to power our sails when we embark on major ocean passages. Unfortunately, the seas are quite large and lumpy in the trade wind belts. The wind itself blows around the clock, and is occasionally reinforced by a vicious squall or two. Suddenly it's gusting thirty-five at midnight, and the over-canvassed yacht is careening out of control. Multihulls in particular have a way of "going ballistic" in such conditions. They do some madcap surfing, and have been known to spin out dangerously. While a spell of controlled surfing can be exhilarating, chaotic midnight surfs can be downright dangerous. This is where the partial braking mechanism of a speed-limiting drogue can make all the difference. And the transition from chaos to control is nothing short of miraculous. No sooner the drogue takes hold than everything calms down. Suddenly one can relax, go down below and try to regain one's composure and sanity. Victor Shane speaks from firsthand experience on his tiny trimaran in which he sailed from Maui to California. Bars And Narrow Entrances: A speed-limiting drogue can help maintain directional stability and control while negotiating dangerous bars and narrow harbor entrances. Some of the harbors lining Australia's Bass Straight are notorious in this respect, and it should come as no surprise to find that Seabrake was born there. Inventor John Abernethy, speaking from a lifetime of firsthand experience, recommends that the drogue be towed off the windward quarter to facilitate safe entry. The drogue will help keep that quarter from slewing around, making the job of the helmsman much easier. Emergency Steering Device: Towed off the stern with an adjustable bridle tied to corner cleats, a speed-limiting drogue may be used as an emergency steering device in the event of normal steering failure. Get the drogue properly positioned in the wave trains and then shorten one bridle arm and lengthen the other until the boat is pointing in the direction you want to go. Safe Tow: A great many vessels are damaged when they are taken in tow by a tug or a ship in heavy seas, usually because the ship and the yacht are diverging and converging on the wave trains. At any rate the tension in the tow line is seldom constant. It has a way of grabbing and letting go, sometimes producing a dangerous whiplash effect. If your vessel ends up needing a tow in mature seas, you can make that tow much safer by deploying a speed-limiting drogue behind your own boat. Properly positioned, the drogue will immediately smooth out the ride and eliminate "whiplash." 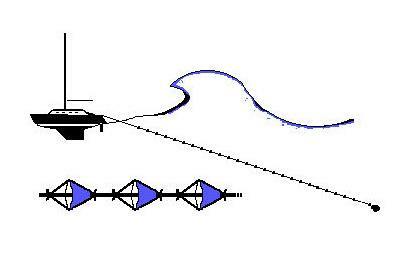 Autopilot Assist: Deployed off a quarter, and properly positioned on the wave trains, a speed-limiting drogue can significantly increase the efficiency of your autopilot when the wind is off the beam. It may enable a weaker autopilot to take over the job of steering your boat, allowing you to go down below and get some rest. This is especially true of mechanical windvanes on downwind legs, where the wind needed to activate the vane decreases in proportion to the speed of the boat. The faster the boat sails, the less the apparent wind - and the more sluggish the windvane. Use the drogue to slow the boat down, and instantly the wind-vane's performance increases. 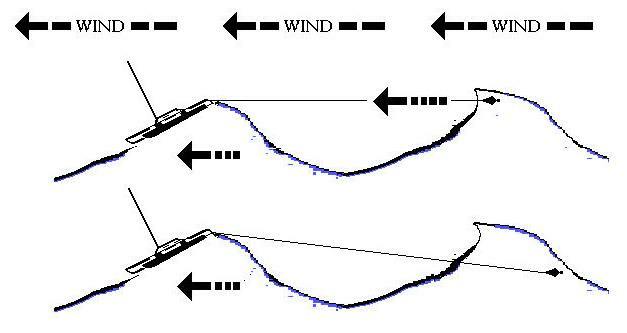 The criterion that sets a speed-limiting drogue apart from other drag devices is that its low pull allows a significant amount of directional control through the helm. It is an interactive - steering-assist - device, in some sense doing the job of a long steering oar trailing far behind the boat. You can - and may have to - steer the boat while towing the drogue. All of which brings us to a certain "catch-22": The same low drag that allows for steering control may allow the boat to broach, capsize and even pitchpole in a once-in-a-lifetime storm. The forces that pitchpole yachts are so explosive that they may just yank the drogue through the water as they are throwing the yacht end over end. 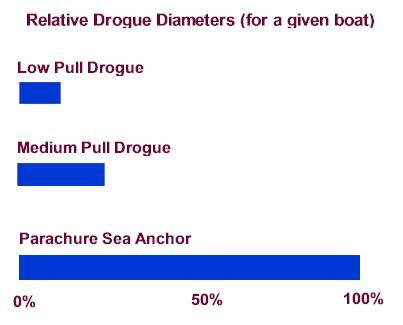 I would like to emphasize that the drogue must have a certain minimum drag - equivalent to a 3 to 5 ft. diameter chute. The conventional 21-inch cone or trailing warps, etc., are ineffective. With the proper size drogue the boat lies essentially dead in the water.... However, in the event of a large breaking wave strike, the drogue is pulled through the water for several seconds.... The motion of the drogue reduces the peak loads - although the load can still be very high, of the order of the displacement of the boat. The table below is taken from the Coast Guard Report (CG-D-20-87) co-authored by Donald Jordan. It shows the single-element drogue needed to produce the effect he describes above. A 25,000 lb. boat, for example, will require a cone or parachute with a diameter of about 4.5 feet. With this, the boat will lie essentially dead in the water - no steering involved or possible, the crew inside and "strapped in by aircraft type seat belts." When the boat is struck by a breaking wave the drogue will get pulled through the sea for several seconds, (a) reducing peak loads, (b) keeping the vessel aligned and (c) gradually pulling it free of the wave. Here is the ten second play-by-play: The yacht is stationary... she gets struck by a breaking wave... she accelerates to wave speed briefly... she is held in alignment by the building resistance of the drogue... the resistance reaches a peak... the yacht decelerates, working herself free from the mass of moving water... now she is stationary once again, ready to negotiate the next breaking wave. Jordan's Coast Guard research and the research conducted by Barry Deakin at the University of Southampton have both shown that the use of a single-element - medium-pull - drogue leaves a great deal to be desired in breaking seas. For one thing there is again a good chance that the smallish cone or parachute will foul itself, or get turned inside out. Another basic disadvantage has to do with the potential delay between wave strike and drogue reaction. 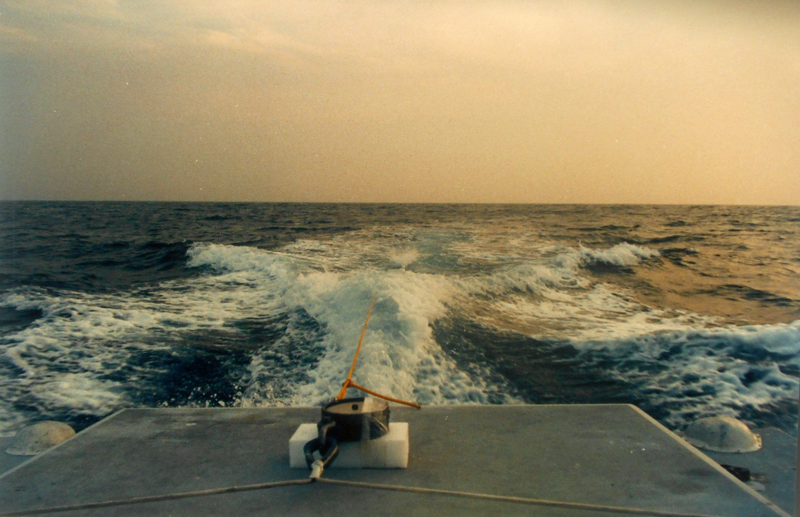 When the boat is lying to a single-element drogue at the end of a long line, she may get "derailed" in the few seconds that it takes for the drogue to react. If the cone or parachute is not positioned properly, orbital rotation may induce enough slack to open a window of vulnerability, perhaps allowing the load to be "dropped" on its side. And since the boat is swinging on the end of a long pendulum, the jeopardy increases if rogue waves - from a secondary storm system - are intersecting the existing wave trains at an angle. If, by some stroke of luck, the resulting breaker/s strike the boat squarely on the transom, the yacht may do a bungee jump and somehow survive. But if the avalanche strikes her at an angle, she may get smashed down on her side before the pendulum can finish its swing. To do away with these disadvantages and still retain the benefits of the medium-pull concept, Donald Jordan conceived an articulated drogue, better known as the series drogue. 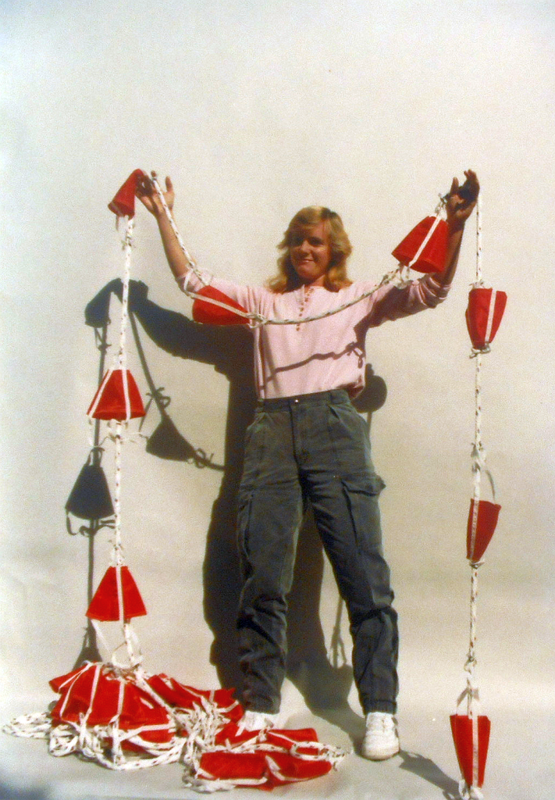 Depending on the displacement of the boat, 90 or more 5-inch diameter cones are spliced into a 300-ft. tow line at 20-inch intervals, their combined drag being the equivalent of a single 3-5 ft. diameter cone or parachute. 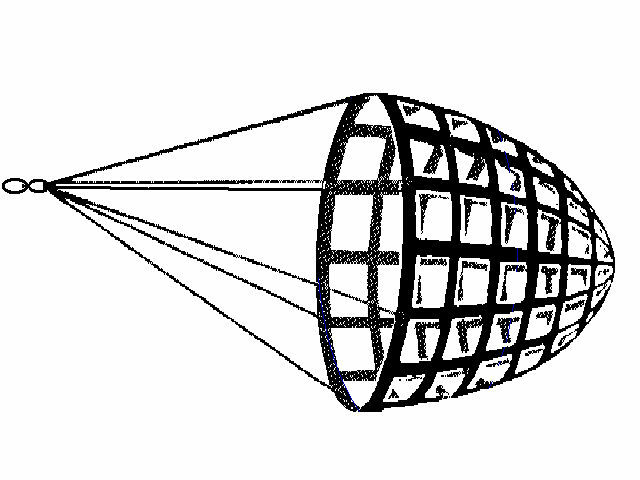 The figure below, also courtesy of the US Coast Guard, shows the number of 5-inch cones required to produce the effect Jordan described in his letter to Shane. Note that a 25,000 lb. boat will need about 130 cones. A 35 lb. weight (usually an anchor or chain) is attached to the end of the array, causing the system to hang down at an angle. The whole of the array should ordinarily remain well submerged and for the most part unaffected by orbital rotation. Upon moderate wave impact some of the cones may surface. In a severe wave strike many - or all - of the cones may surface. One can imagine what it might feel like to be in a storm with the series drogue deployed off the stern and a wave breaks: one feels a brief acceleration... one feels a pronounced deceleration. The sensation should be very much like that of a theme park bungee jump. This particular bungee jump should be a relatively safe one. Jordan engineered it that way. Unlike the concept of a long tow line with a single-element drogue at the end, which in effect puts all the eggs in one basket, the series drogue spreads the drag over 90-150 cones and about 300 feet of tow line, usually enough to span two wave lengths. 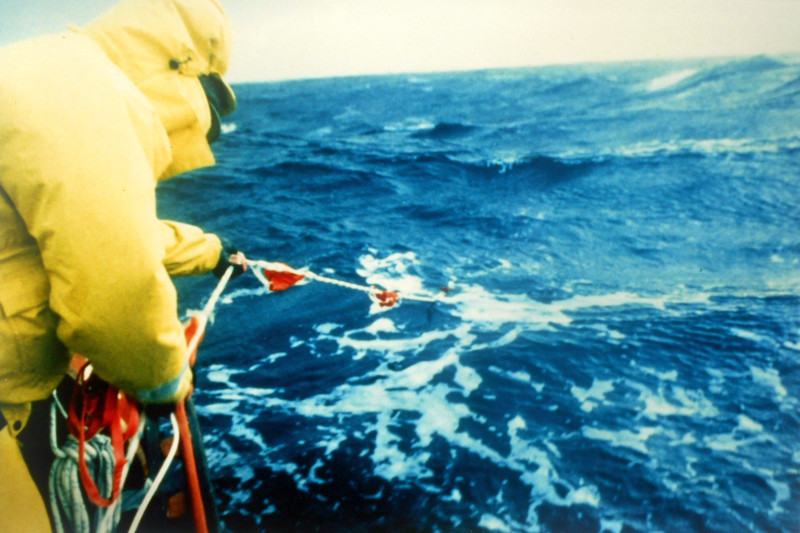 In theory the heavy weight at the end of the array should always be sinking, pulling the drogue away from the boat, reducing the possibility of excessive slack - and a large window of vulnerability; and the existence of cones near the boat means that the pendulum doesn't have to swing so far to render assistance. If a rogue wave is approaching from an angle, there will be cones near the boat where tow line stretch is low. Those cones will build up load much faster than a single-element drogue at the end of a long pendulum. Jordan's own research - a computer study - indicates that two seconds after wave strike the series drogue will develop 40% more load than an equivalent single element drogue. As promising as it appears to be, the series drogue has an obvious disadvantage in that it exposes the relatively vulnerable stern of the boat to the mega-force of breaking seas. In some respects it tries to make capital of the vice of a boat and, in a scientifically calculated, ingenious way, turn that vice into a virtue. No small accomplishment. There is caution due, nevertheless. The truth is that many production boats just cannot handle mammoth breaking seas on their sterns. 90-150 Five-inch cones, spliced at 20" intervals into 300 feet of double braid nylon tow line (see inset) with 35 lb. weight at the end of the array to keep the cones submerged. Jordan himself was quick to point out that the wide open, exposed and vulnerable stern areas on such boats must be reinforced and waterproofed to accommodate the series drogue. A somber reminder: In chapter sixteen of Coles's Heavy Weather Sailing (third edition) we read how that the yacht Marie Galante II was running under bare poles "with two warps streamed aft, but at about 1800 hrs.... she was struck by three heavy breaking seas. The first smashed the transom and stove in the cabin doors and flooded her." Note that Marie Galante II was running, and not standing still. Even so, the first breaking wave smashed in her transom, broke through the companionway and flooded her interior. Understandably, many sailors are reluctant to expose the vulnerable sterns of their yachts to the mega-force of breaking waves. Indeed many an existing production sailboat is in a compromising position when her stern is exposed to a storm. And it is sobering to note that Marie Galante II did not survive the deathblows to her stern. The second wave capsized the yacht and broke her mast. The third caused her to fill and quickly sink, with loss of one life. Ask yourself some questions. How would your boat fare if she were positioned stern to a twenty foot fall in the rapids of the Colorado, with her transom bridled to shore rocks with thick bungee cords? Would she be able to withstand the tons of water falling onto her stern for twenty-four hours? Would the attachment cleats be able to handle the loads, or would they need major reinforcement? Would the hatch boards withstand the battering ram of tons of moving water, or would they need major reinforcement as well? Have you visualized the cockpit looking like a perpetual swimming pool? Have you ever plugged the drain holes and deliberately filled it to the brim to see what it might look like? Breaking waves are rare. One may spend a lifetime crossing oceans in a wise and deliberate manner, and never run into one. But if one does, the series drogue will keep one's sailboat optimally aligned. 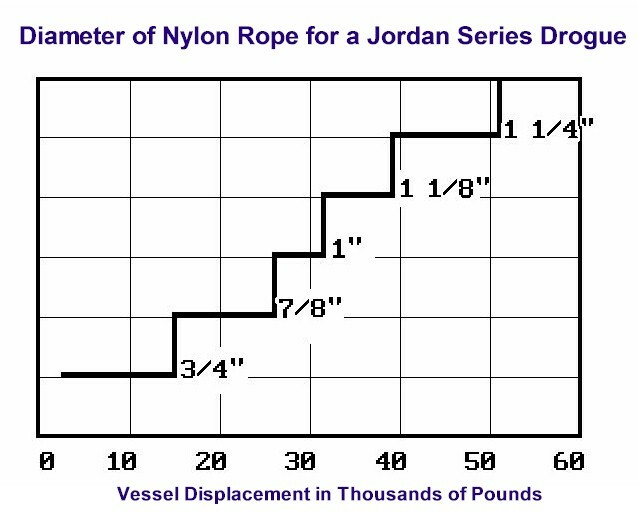 Purely in terms of vessel alignment, the Jordan series drogue excels other drag devices. Is it panacea? Hardly. There is no such thing at sea. Only human ingenuity, coupled with the discipline of seamanship. In, of and by itself, alignment is not necessarily the be-all and end-all of sea-state tolerance. Ultimately our goal is to improve the survivability of the vessel and the crew, not to see who can come up with a better way of keeping a yacht aligned. 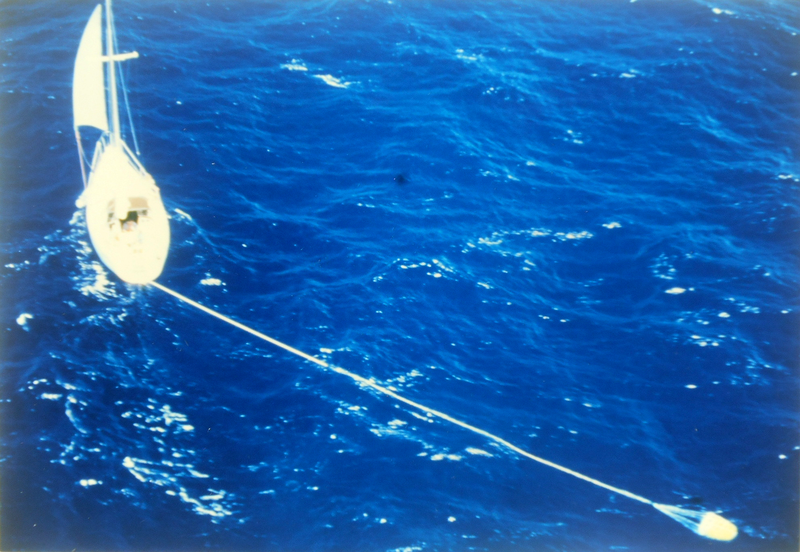 We have already inferred that people can somehow survive inside modern sailboats, as long as the hull/s can be kept afloat; and we have examples galore, in Fastnet '79, the Queen's Birthday Storm and in later storm reports, of boats that were prematurely abandoned only to be found floating afterwards. So then, if a drogue in some way increases the risk of sinking, that risk has to be weighed in a proper balance. And it goes without saying that the orientation of the boat prior to sinking will be immaterial to the crew that ends up in a life raft. Whether the dear old girl sank because she was rolled while lying a-hull, or whether she sank because a wave broke through the companionway while she was being held in perfect alignment by a series drogue is besides the point. Drogue: See Appendix III at the back of this publication for a list of manufacturers. Refer to manufacturer's recommendations for sizing. Drogue sizing is not a precise art. A grossly undersized speed-limiting drogue has a peculiar advantage in that it can be routinely deployed in the course of ordinary passages. After all, if it enhances off-the-wind helm control at the expense of a knot or two of speed, there's nothing wrong with that is there? On the other hand, a grossly oversized drogue has a reciprocal advantage in that it can come closer to producing the medium-pull effect described by Donald Jordan. Notwithstanding, the "standard" for sizing, if it can be called that, says that a yacht should average 3-6 knots with a speed-limiting drogue in tow. This seems to be the general consensus among the more experienced drogue users interviewed by Shane. Rode: For speed-limiting drogues it makes a little more sense to use a low-stretch tow line (less chance of bungee jumping if the load happens to get dropped). All the same, most of the sailors who submitted drogue files to this publication used nylon tow lines. Refer to manufacturer's specific recommendations. Chain: Most speed-limiting drogues ride near the surface of the sea where they are prone to surface action. In fact they may loose much of their "bite" if they surface in certain conditions. The use of a short length of chain will help minimize this. Fifteen or twenty feet of chain, attached to the drogue itself, will help to keep it better submerged. It will also help keep it from being pulled out into thin air on steep wave faces. Refer to manufacturer's recommendations. Rode Length: Positioning the drogue is quite important because of the possible effects of orbital divergence and convergence. In some cases, convergence may allow the vessel to turn sideways in the troughs. A little rode adjustment will usually smooth things out. Ordinarily one lets the rode out, a few feet at a time. One does this only if the yacht and the drogue are very obviously "out of synch" on the wave trains. Otherwise one leaves well enough alone. Proper positioning is important for another reason: again, if the drogue is being used in steep, wall-like seas it may get pulled out into thin air. Peter Blake ran into this problem on Steinlager II - see File D/T-1. If the drogue is on one steep wave face when the yacht is surfing down another, it may get pulled out into thin air. It can be positioned on the "meatier" part of the wave to prevent it from doing so. One should try to position the drogue in the "meaty" part of the wave so that it can't be pulled out of one wave face when the boat is surfing down another. The general consensus among the more experienced drogue users interviewed by Shane goes something like this: Try to position the drogue so that it is on the back of the second wave when the boat is on a crest. Chafe protection: Same as sea anchors - refer back to the sea anchor section. All things considered, chafe is the remaining monkey wrench in the whole works. Never take anything for granted about chafe. Let there be no doubt in your mind that after you have done all the difficult work of deploying, adjusting and properly positioning that expensive drogue, you stand in constant jeopardy of losing the whole rig to Murphy and the little green chafe demon in his hire. For your information this little devil gets paid overtime in storms, in addition to which he gets an extra bonus every time he succeeds in getting a line to chafe completely through. Drogue: At the time of this writing there are a few companies around the world that will either make up a complete series drogue for you, or provide you with an easy to assemble kit (see Appendix III). Pay meticulous attention to Donald Jordan's guidelines as to how many cones you will need, and how the whole system should be rigged. 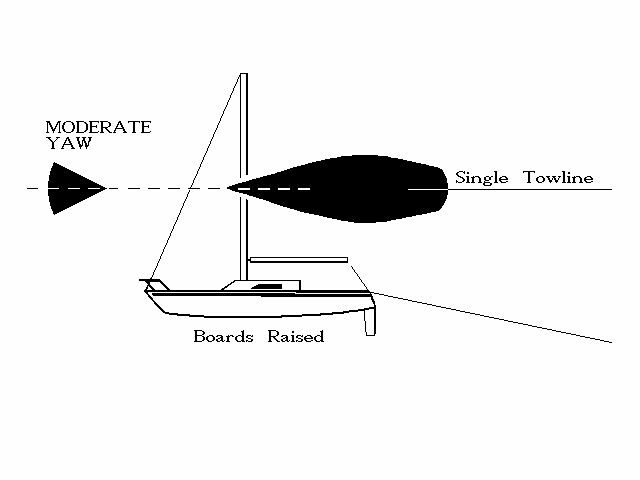 For starters, you should find out how much your boat will weigh when she is fully loaded, in order determine how many five-inch cones you will need (refer back to diagram). The cones themselves are easy to make. A few resourceful sailors have bribed their wives to put the household sewing machine to work. 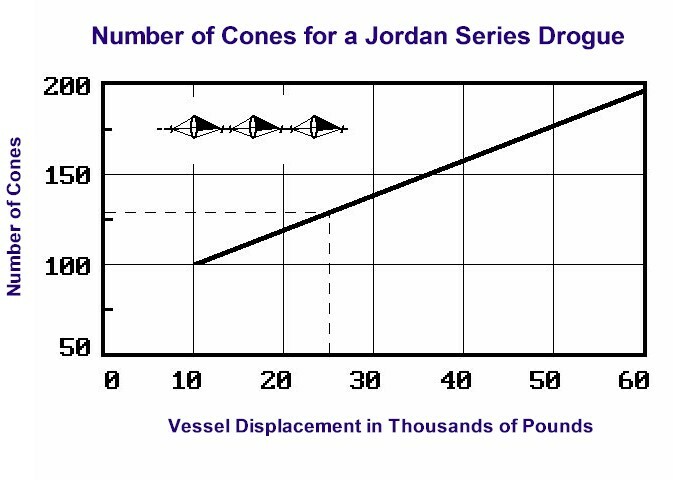 Jordan's Coast Guard fatigue tests have shown that the individual cones need not be heavily constructed. Since the load is divided over so many cones, the bulk of the array should continue to function even if a few individual cones fail. The series drogue is easy to make albeit time consuming. It can be made out of spinnaker cloth and a few rolls of 3/4" nylon tape, using a household sewing machine and a pair of scissors. Many years ago Victor Shane obtained a single five-inch cone from Donald Jordan, made up some prototypes, and later a number of complete series drogues. In early trials he soon found that he could not load a single five-inch cone for anything more than 250 lbs. no matter how hard he tried. In one sea trial a single cone was spliced to a weighted line, lowered off the transom of a stationary test boat and allowed to hang fifty feet straight down in calm water. The 360 hp Mercruiser was then punched full bore and the performance of the cone measured on a calibrated Dillon Dynamometer as the boat sped up to 30 knots. In the course of two dozen controlled runs the load always peaked just before the cone could surface, and it was never anything more than 225 lbs. It is important to understand that the series drogue must be well-submerged to do the job it was intended to do, whence the need for the heavy weight at the end of the array. These tiny cones all but lose their purchase once they surface. By way of a digression, Shane once approached Donald Jordan with the idea of a multi-purpose series drogue. The clever idea went something like this: "What about letting out just a few cones to get the effect of a speed-limiting drogue, and then letting out additional ones as the storm builds?" Jordan's answer was an unequivocal "NO!" It seems he has designed the series drogue for one thing only: capsize prevention in breaking seas. He did not design it for partial use as a speed-limiting drogue. Besides, the tiny cones all but lose their bite once they have surfaced. There is a great deal of redundancy built into the series drogue. If a single cone can easily pull 200 lbs. then a hundred cones should easily pull 20,000 lbs. So the individual cones need not be fabricated from ballistic nylon. Even spinnaker cloth rip stop will do (one sailor made up a series drogue from an old spinnaker). The pattern of the cone is easy to cut with scissors. And even easier if you have a $15 Eastman Wheel Cutter (model ST-810) and a $20 cutting pad (both available from most sewing outlets). If the cloth has a good coating on it the edges of the cone need not be hemmed, which cuts the sewing job down in half. In Shane's experience, hemming the curved edges of the cones was the hardest part of the sewing - a nightmare, given the tight radius. Coated cloth is therefore highly recommended. Otherwise the newly cut edges should be basted with some sort of fabric glue to keep them from fraying. RECOMMENDED TOW LINE (SERIES DROGUE): Diameter of Nylon Double Braid. Note that non-stretchable floating Dyneema can also be used for the tow-line. It's main advantage is that the overall weight of the drogue becomes much lighter and so is much easier to man-handle on board. Series Drogue Assembly: Ordinarily one would buy the cones already manufactured - in kit form - and splice them into one's own tow line. Splicing a hundred or more cones - six attachments per cone - is easy but time consuming. This is why the labor cost of a ready-made series drogue can double the cost. Assembling an entire series drogue is not the sort of thing that can be done in a few hours. One should allow several relaxed weekends. A large, clean work bench, a little music and a bottle or two of refreshments will make the job more pleasant. Make yourself comfortable and start attaching the cones to the tow line size recommended by Donald Jordan as per the diagram above. A specialty splicing tool conceived by Donald Jordan is usually included in the kit. There are six easy splices on each cone. Using the splicing tool, one physically inserts each tape through the outer braid of the rope and ties a knot at the end. These knots have not been known to pull out of the rope under load (remember the rope will be bar tight when a wave breaks). IMPORTANT: The attached cones should hang loose on the tow rope. When attaching the cones fore and aft, a loose fit is paramount. The aft attachments are relatively unimportant (the only thing they do is to keep the cone from getting turned inside out by its own wake). If the fore and aft attachments are too far apart the cone will get stretched, as though on a rack, and the mouth may not be able fully to open under load. Always attach the front three tapes first, and when attaching the rear ones leave enough slack so the mouth can fully open. The result should have a limp look about it, the fore and aft tapes hanging rather loose - not pulling on each other. USEFUL TIP: After attaching the very first cone, stuff it with crumpled up newspaper so that it looks as though it is wide open and under full load. Stretch the tow rope, and then check the rear tape tensions on the cone. They should still be loose. Bear something else in mind: the nylon tow rope will itself be stretching under load as well. Three hundred of the splices of the first series drogue made up by Shane had to be disassembled and redone because the cones had been fastened onto the tow rope too tightly! Never take anything for granted when it comes to deploying any sort of drag device, even a low-pull speed-limiting drogue. All lines must be properly organized, flaked out, coiled etc. Keep arms and ankles out of the coils as the line goes out. This is easier said than done, especially at night, and especially in the case of a madly surfing multihull. Multihulls running at higher speeds should brace for a jerk when the drogue takes hold. In the case of a Westsail 32 running at seven knots there should be no jerk when the drogue takes hold. In the case of a 60-ft. Newick trimaran screaming along at fifteen knots there may very well be one. Here is the same good advice you've heard before: Don't leave it too late. Series drogue deployment is not difficult, but may take a while. Most of the users interviewed by Shane said they let the series drogue out a little at a time - meaning they didn't just dump the entire three hundred foot array into the sea. To be fully effective, the series drogue must be attached to the stern via a bridle (same diameter rope). Make certain that this bridle will clear all stern objects - pulpits, davits, windvanes, solar panels, etc. Remove all removable stern objects, or the sea will remove them for you. Unless the wind and seas have completely died down, retrieving any sort of a drogue while underway can quickly sap the strength of the stoutest sailor. After half a day of deploying and retrieving drag devices in windy conditions off Diamond Head, Hawaii, Shane's arms began cramping to the point of uselessness. This was in spite of the fact that a cockpit winch was being used, and in spite of the fact that he was being partially assisted by two other able sailors, one of them Earl Hinz himself. Winching a drogue in off the stern, with the boat underway, is like working against the pull of a tractor. This method of retrieval may be unavoidable at times. Usually, however, it is a lot easier to "switch cleats" and bring the drogue in off the bow. Switching cleats is recommended if conditions allow it. One merely leads the bitter end of the tow rope around and outside all stays, stanchions, etc. and attaches it to the bow-cleat. One then comes back to the cockpit and takes the drogue line off the stern cleat. The boat should then round up ninety degrees, stop, and lie broadsides. With the drogue now leading off the bow, it can be pulled in with relative ease (no more fighting the tractor), although one should allow plenty of time for this as well. Don't force anything. Don't strain your wrist as one sailor did. Give the rode half a turn around a cleat and wait for slack. Pull in a few feet and repeat until the drogue is in hand. Unfortunately we don’t have any case reports of Attenborough Drogues specifically. However, it is a “low pull” drogue, so the case reports about other types of low-pull drogues (such as the Galerider, Seabrake, Delta etc) will apply to yours. Likewise the sections about drogues and lessons learned. My suggestion is that you read through the DDDB to see how drogues are deployed, and then go out and do some test deployments. For your first try you can go out in a calm under motor. Then, once you have an idea of how it works, try it under sail in a moderate wind. Then you should be pretty well organized in case you need it in a real blow. Seeing as it is made of steel and not cloth, you probably do not need to add any extra weight (such as chain) to it, as you might with the soft drogues. Several sources (Steve Dashew, Earl Hinz) recommend use of a drogue to stabilize an anchored vessel in wind-against-current situations. Can you point me to any information on this subject, particularly sizing the drogue, and appropriate conditions? I have corresponded with one manufacturer of drogues who was of the opinion that a drogue would be ineffective in this usage. That is certainly an interesting idea, though I cannot see that it would really be useful except in very unusual situations. A drogue would certainly help to align the boat with the current. But, unless the current is pretty weak, it usually wins out over the force of the wind trying to turn the boat into the wind. The exception might be if you are in a power boat, with a strong cross- or counter-wind, in an anchorage full of sailing boats. The sail boats, having keels, will probably align with the current. You, having no keel, but a large superstructure, might align with the wind. Thus you might be pointing a different direction to the other boats or could even be hanging off your anchor in the opposite direction, which could cause issues. In such a case, a drogue on a very short rode (so as to not create more of a hazard!) might help to turn you into the current the same as the sail boats. Having said that, a drogue’s power increases with the square of the speed of the current. In slight currents it may not have the power to turn your boat from the wind. In strong currents you will probably lie to the current anyway. In strong wind against strong current situations you will probably want to find somewhere else to anchor anyway, though this is the situation in which it would be most likely to work. The turning moment of a keel is different from that of a drogue pulling from the stern. As a boat turns away from the current, the force on the keel dramatically increases as it presents a larger surface area to the current. This acts as a powerful force to keep the boat headed into the current, where the force on the keel is at a minimum. This the exact same reason why feathers on an arrow keep the arrow on a straight course. In contrast, the force on a drogue will be constant. It then depends on the angle the rode makes to the centerline to produce a turning motion on the boat. This obviously decreases as the boat comes into alignment with the current. With a strong cross wind, it is likely that the drogue would only have a partial affect on realigning the boat with the current. On the other hand, with a full wind-against-current situation, the drogue would likely work to pull your boat downstream, the same as the sailing boats. As with trying to steer a boat using a drogue, you would want to attach it using a short bridle with the arms as far apart as possible. So, all in all, it is not a tactic that is likely to work too well in most situations, thought certainly one to keep in your bag of tricks for that unusual case. Thank you for your quick reply. The case I’m looking at is indeed for a monohull sailboat, anchoring in gale or near-gale conditions in the channels between the Bahamas islands, particularly the Exumas. There we may see reversing currents on the order of 3 kt, and the boat is “pushed by the wind, and aimed by the water,” so pointing into the current and up-current from the anchor during half of the tide cycle. This is an unstable attitude, as the wind attempts to spin the stern around, causing much charging to an fro, with the occasional piourette. The intent of the drogue would be to stabilize her in her position (bow into the current), resist the efforts of the wind to make the stern pay off, and to some extent counter the force of the wind overall. For a 15T sailboat in 30 kt of wind it looks like we need to counter about 1000 lbs. of wind force. Since Mr. Hinz recommends the tactic in one of his books, if you are in touch with him, it would be gratifying to hear his comments. Thank you. That would, indeed, seem to me to be a situation in which it could help. I am sorry that I am not in contact with Mr. Hinz. If you have a drogue aboard (but not a series drogue), it would be an interesting experiment. But be careful, with reversing tides, that the drogue rode itself does not get tangled around your prop or your ground tackle. Also 3 kts of current would be way too much to use a parachute anchor.